I promise, I wasn’t totally delusional. I’m certainly open to the idea of getting a dog once our kids are old enough to play with it, take it for walks, etc. but right now, there is no way on the face of the earth I’m getting a dog… because what was the likelihood that we’d find a dog that met my ridiculous list of criteria. Right? Plus, all of Dave and my siblings have dogs so our kids can just play with their dogs for now! Well, about a week before James was born (I was already 1 week overdue) my sister emailed me a picture of a 5-year-old labradoodle, and said it was “free to a good home”. I figured something must be wrong… but I emailed her back anyway. Well, she had done it — she had found a free dog that met every single thing on my list. On top of all that, the current owners were going to give us the kennel, the collar, the leash, the toys, the extra food, etc. and get it groomed one more time before they gave it to us. And, just to sweeten the deal, they said they would keep the dog until we had the baby and life settled down a bit. Dave and I talked about it and thought that aside from the horrible timing, this sounded like the perfect situation and the perfect dog for our family. We even took Nora and Simon to go play with the dog (Abbey) and they seemed to hit it off. We asked the owners to give us a couple days to think about it… but Dave and I were actually pretty excited and planning to say “yes”. However, then I remembered the post I wrote several months ago about The True Cost of Our Stuff. I’m sure some of you might be thinking how boring, or un-fun, or super cheap I sound right now — but the fact of the matter is that even inexpensive (or free) items usually come with hidden costs that might end up being a burden later on. So even getting a fabulous deal or an awesome freebie almost always ends up using many MANY resources over it’s lifetime in your home. After reading that post, I told Dave I didn’t think it was great timing for a dog — and believe it or not, he actually agreed with me. He said he had been second-guessing it as well, so we both willingly put the kibosh on our free dog. 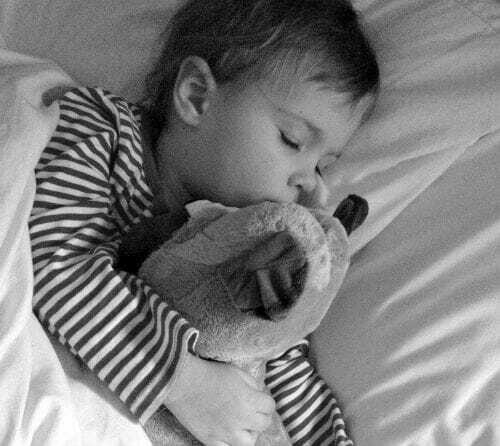 The fact of the matter was that even before having James, I was fully aware of how crazy and tiring and unstructured life would be in the months following his birth. I had already brought 2 babies home from the hospital and I knew how busy it was going to be. I couldn’t possibly fathom adding a new dog to our family right in the middle of that crazy time! I ended up going into labor that night and called the dog owners from the hospital the next day to let them know that we would not be able to take the dog. They completely understood and I’m sure they had no trouble finding new owners for their freebie dog. Now, 2 months later, I honestly can not even imagine making the time to care for a dog — feeding, walking, playing, picking up poop, washing her, cleaning up the house after her, etc. I’m sure our kids would have thought the dog was cool for the first 2 weeks, but then it would have been ME doing everything for the dog while the kids ignored her. We will probably get a dog someday… just not right now! The moral of the story: Free isn’t always free. Even if you get something for free (or very inexpensively) there are still so many “costs” of maintaining that thing, caring for it, cleaning up after it, making a space for it in your home, etc. etc. So while I’m certainly not trying to sway you from finding a great deal (or getting a dog), I would encourage you to really stop and think about any hidden costs (financial costs, time costs, energy costs, and space costs) before you bring something into your home. 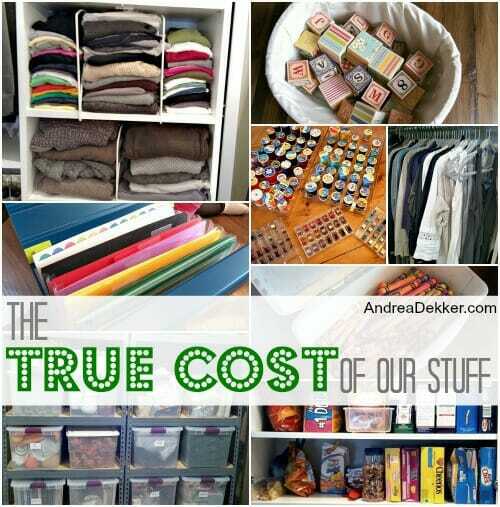 In my opinion, we would all have a lot less clutter, a lot more time, and a lot more energy if we thought about the true cost of our stuff a little bit more! Also, if you haven’t read my post about The True Cost of Our Stuff, you can read it here. This is really perfect timing for me. I’m one who definitely leans towards the emotional and physical needs of a dog. I’ve never owned a dog and my husband on the other hand has owned 2 in the past and knows how to train, care, and love them well. I was convinced this weekend that we should get a frise bishon breed. My husb is un-budgeable to his resolve that a dog is not something we want or need because there’s more to them than just cuteness. My five sibs and I spent a lot of time pitching free dogs at my Dad. He always responded “There is no such thing as a free dog.” As a retired adult I took in an adorable stray. Just for fun I kept track of the first year’s expenses–$850. I’m now quite active in cocker spaniel rescue. 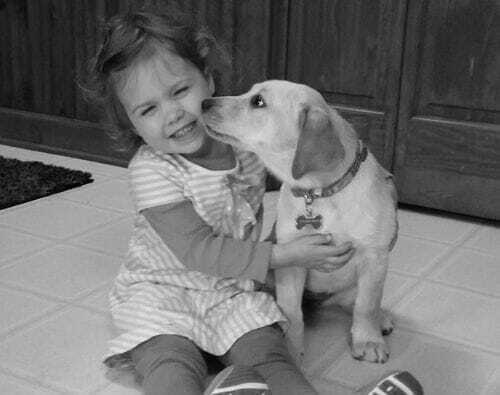 We advise families not to get a dog until the youngest child is eight. Dogs add so much to the general chaos–it’s another body with hair to brush, nails to trim, bedding to wash, and preventive meds to remember. Life is long–I’m happy to have saved some experiences for a time when I can savor them. You are right! The dog we paid $250 for has been much less expensive than the “free” dog and “free” cat we have. I love my animals, though, so they are worth the expense to me. So true!! My litmus test – even if it is free, I have to be willing to pay for it to accept it. It forces me to think about whether I really want something. Also, timing is everything. My sent my two dogs to live with my parents after #2 was born. There is enough chaos in the house without having to worry about feeding and walking another family member. This is so true. We live in the country and someone dumped a kitten on our property. The kitten was hungry and skinny so we fed her. Then my daughter named her. Well, it is now three months later and she was still around so I took her to the vet. In the blink of an eye, we spent over $500 at the vet for tests, meds, and spaying. Now, Winter is coming and our indoor cat just tries to attack the kitten so we have to make accommodations so the kitten has a warm place to stay that our indoor cat cannot get too. I has been way more than we ever imagined but the kitten is so loving and my daughter loves her. If you have a choice, it is better not to get started; once you do, there are huge responsibilities and expenses with a pet. oh wow — that’s a big chunk of change for a stray cat! I do think we will get a dog eventually, but Dave and I are both happy we passed on this seemingly good opportunity! I applaud you for taking the responsibility of pet ownership seriously. So many people get pets as a cute friend for their kids not thinking about the expense, time and the emotional and physical needs of the pet into account. I believe you are. Our family had an elderly dog we lost right after our son was born. My husband and older daughter were pressuring me to get another dog but I knew with a new baby I just wasn’t up for it. Having a dog is like a perpetual toddler..you love them but there is certainly a good amount of work and expense required. I had a(n eerily) similar list to yours and I was patient and stood my ground until I knew our family was ready. We have had a wonderful Schnauzer/Carin Terrier mix for the past 5 years and she is just the sweetest, most perfect dog for us. An acquaintance was giving her up and she was spayed, up-to-date on vaccinations, trained, etc, etc.. I think another thing to think about in the meantime is what type of dog fits your family..really pay attention to the natural inclinations of the breeds. Our dog doesn’t particularly like cats or other small animals but that suits us fine. Some people end up with a ‘bad dog’ when in reality they didn’t think about the activity level or neediness of a particular breed and when it does something instinctive to its breed or nature people become upset at the dog. Thanks for being honest and for an interesting post! Love all your posts Andrea! They are always so insightful! We got a puppy with a 1 year old…wouldn’t recommend it! You are totally right on about this. We got a free dog in June. The vet bill last month was almost $200 with all his meds for the year, his food is about $30 a month. Now we also have to add in boarding the dog to the cost of our vacations. We love the dog and are glad to have him, but there are definitely lots of maintenance costs. glad you love your pup! We had a cute little dog growing up too, but I know he was expensive. He had to be groomed every month, have meds, vet bills, etc. My parents didn’t get him until my sisters and I were older, so we could actually help to take care of him. No offense, Andrea, but until you can give credence to the emotional and physical needs of the dog, you should not get a dog. I think she was considering those needs, which is why she turned down the dog.